Inbound is Not Just About Leads. Great. Now You're Ready to Get Inbound and Start Getting Leads. Inbound is not just about leads. It's about revenue. Plain and simple. The fundamental way the internet has changed buyer culture is by empowering them to choose what, when and how they want to engage the purchase process. Today, U.S. Internet users spend three times the minutes on blogs and social networks than on email--a simple fact that illustrates how much buyers prefer engagement with platforms and processes that allow them to drive things, rather than the other way around. How to understand your options for engaging an inbound strategy. Don't wait. 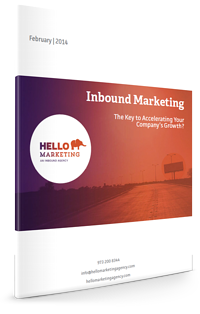 Get your definitive guide to understanding inbound marketing now!